After returning our safari truck to Johannesburg, our next stop was Cape Town. To get to Cape Town, we had a few different options. We could have flown or taken a bus, but after reading some glowing reviews of the Shosholoza Meyl train on the Seat 61 train blog, we decided to take to overnight train. We booked a 2-berth sleeper compartment for the train leaving on a Sunday at 12:30, with expected arrival in Cape Town the next day at 3:30 PM. So we knew it would be a long trip, but we were hoping to see some nice scenery along the way. Our little compartment was nice and cozy. We had one bench seat that turned into a bed, and one top bunk. We had to pay a little bit extra for bedding, but it wasn’t too bad, especially since they made the beds for us. The compartment also had a small sink that could be covered by a table. To pass the time, we mostly read books, although we did take a break and play a few hands of cards. 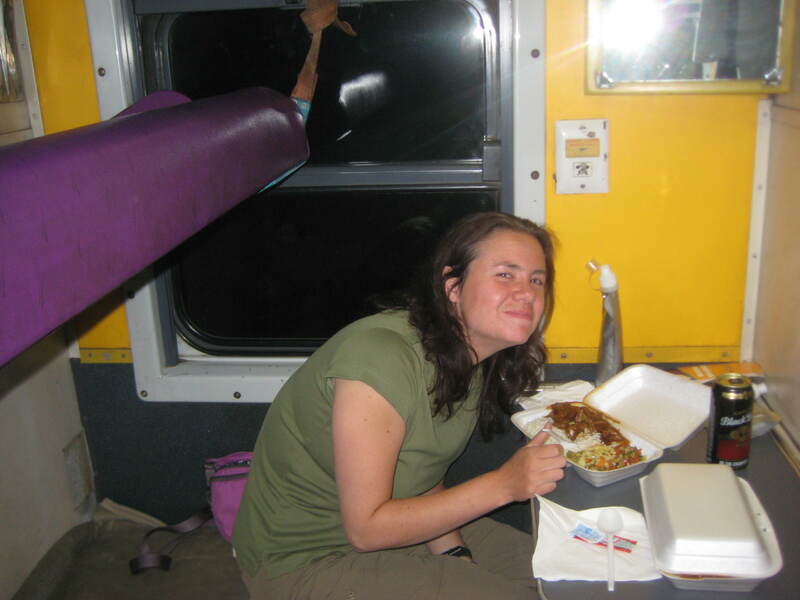 The train did have a dining car, but we didn’t eat any meals there because we couldn’t figure out how to lock our compartment (and we had our big bags in there with us). Luckily though, there was a waitress who came by and took our dinner order and then later brought it. We had a nice beef curry for a very reasonable price. The scenery for the first day wasn’t that interesting, but on the second day as we got closer to Cape Town we enjoyed glimpses of the green mountains and some vineyards. Unfortunately, due to mechanical or other delays, the train didn’t end up getting to Cape Town until 7:30 PM, so it turned out to be more like a 30-hour trip! By the end we were a little ready to experience something besides the confines of our berth! Overall though, we enjoyed the uniqueness of the train journey across the country! We enjoyed it! Quite comfortable actually!